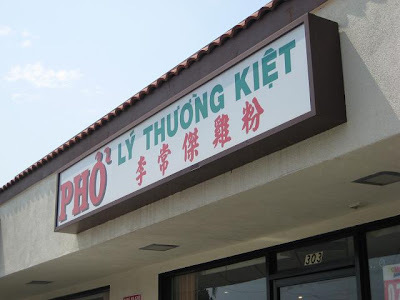 During our last visit to Los Angeles, my mother wanted to introduce us to Pho Ly Truong Kiet, a Vietnamese restaurant specializing in pho ga (chicken noodle soup). Imagine a big bowl of noodles in fresh chicken broth, served with poached chicken. 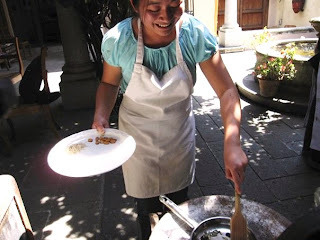 I think poaching chicken in its skin is a great method of preparation. If done well, the chicken stays incredibly moist. 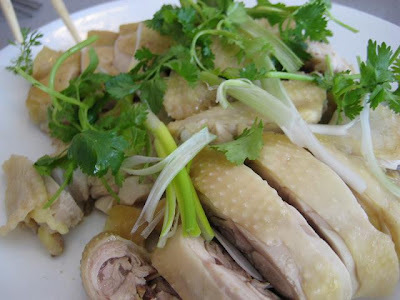 Even though it can be bland, Vietnamese preparations always serve the chicken with a pungent and/or spicy dipping sauce. My mother had befriended the delightfully sweet owner, who runs the establishment with her family. She recommended that we order bowls of plain noodles in broth with half of a chicken to share, which would be cheaper than individual bowls of pho ga dui, which is the chicken noodle soup accompanied by chicken with skin/bone. 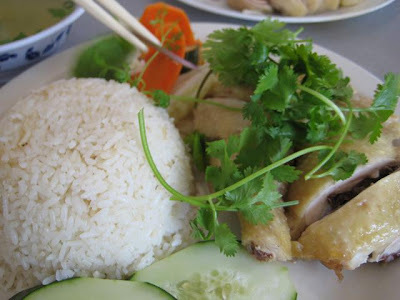 Mom also wanted to try their version of Hainanese chicken and rice, which was good, but the rice was a bit bland. Also, their banh cuon, a rice flour mixture cooked into thin wrappers, then wrapped around a mixture of ground pork and woodear mushrooms. Cooked bean sprouts, cha lua (Vietnamese pork sausage), and fried scallions top the dish. I'd say this was the weakest dish. The wrappers were overdone and the filling bland. The overall effect was a limp rice noodle roll. Later that day, we finally found ourselves with a table at Sinbala. It's a Taiwanese restaurant with a healthy following, but I wouldn't know how the food is because we're not willing to wait ages for a table. Following a huge dinner at Chang's Garden, we crossed the strip mall in hopes of having dessert at Sinbala. Good thing we did, because I've been craving shaved ice like no other. $5 buys five sweet items to pile the shaved ice on. I picked boba (tapioca balls), grass jelly, almond jello, flan, and some other gelatinous sweet that I can't remember. Yes, I tend to go for the jellies and not the taro, lychee, etc. 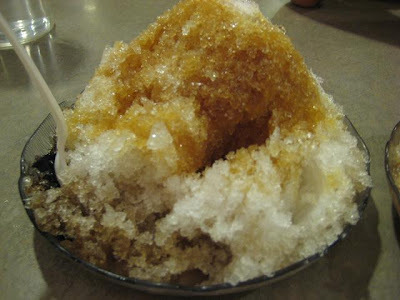 On goes the shaved ice with a hefty drizzle of simple syrup and, my favorite, condensed milk. I'll be back soon for some savory eats. Oh, we love Pho! 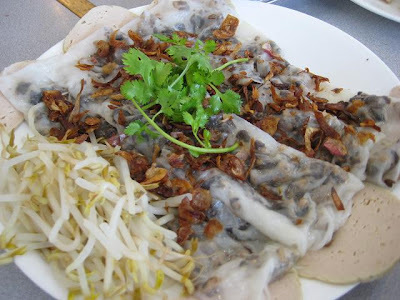 and I especially love their banh cuon, it looks nice, thin with lot of filling! It's not too far from where we live, thanks for the rec!